I was a command post type at Clark. I hate to date myself but it was MATS when I first went to Clark, becoming MAC while I was there 1965 to 1967. Due to a very high theft rate at Clark the security police had horse-back patrols. A young SP was on the far side of the runway, felt the need to relieve himself and proceeded to urinate in a bush. A a bird flew out of the bush to avoid the 'rain' and spooked his horse, which took off and ran onto the runway just as a C-141 was landing. The horse just missed the nose gear and was struck by the pilot's side main gear housing, pealing it back about three quarters of the way. The aircraft left parts of the horse for many many feet down the runway. The pilot finally made it to the command post. He was as white as a sheet and leaned his arm on the counter and in the best air force jargon asked "Where did that f@#k'n horse come from?" They ended up having to fly the aircraft back to Marietta GA, gear down. Thank God no one was hurt. Had the aircraft hit the horse with the nose wheel the landing gear probably would have collapsed. When they first started flying the line with C-141's they had many brake problems. After working out the bugs it turned into a fine aircraft, a real "work horse", (no pun intended). I am a former 60551 (Air Cargo Specialist) (USAF 1965- '69) who has recently discovered your wonderful website. I've been poking around for a couple of days now, and have quickly realized I'm going to be a while taking it all in. This is quite an impressive project you've put together. I'm sure I'll enjoy exploring it as much as I did my small part in the history of the C-141. I posted a message to the recent story about the retirement of the Hanoi Taxi in the May 8 edition of the Military.com newsletter. It explains some of my feelings about the Starlifter. So far, my favorite story on your website is the one in Tall Tales about the C-141 hitting the horse. I was at Clark Air Base the night it happened. In fact, I was wondering if there is any way you can put me in touch with Msgt Del Laughery, who wrote that story. It appears that we were squadron mates and may have some memories to share. Also, I would like to clarify something about his story. He said the aircraft flew back to Georgia with the gear down because of the damage, but I worked in-bound cargo in those days (Dec. 1966), and remember receiving a new landing gear door for that aircraft. It may be that the damage was so great the new door could not be attached, so maybe Sgt. Laughery could elaborate. I also remember going out after sun up to look at the aircraft and getting a little nauseated. The landing gear was pretty torn up, and there was horse flesh, bone and hair hanging from it. Rather sickening, really. Whatever help you can offer to get me in touch with Sgt. Laughery would be most appreciated. The C141A that struck the horse at Clark was flown back to the states with the gear down. The aircraft was ferried back by "island hopping" (Clark, Guam, Honolulu). I was the navigator on the Travis-based 86th MAS aircrew that flew the leg into Hickam AFB (actually land at Honolulu International and taxi to Hickam). 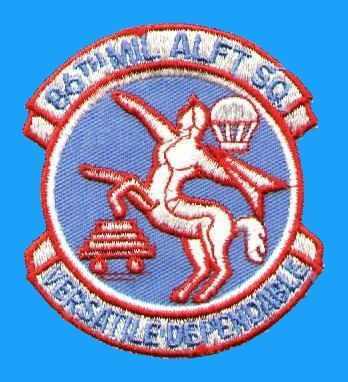 Ironically, the patch of the 86th features a centaur, a Greek mythological creature that is half man and half horse. Although I cannot recall the tail number, I do not believe either the crew or aircraft involved in the Clark incident was Travis-based. The Maintenance people at Clark removed the damaged material from the left side gear pod all the way down to the side of the fuselage. The pod is a fairing and not really structural. Although a landing gear door (and probably other parts for contingency) may have been ordered for the aircraft, it was not installed on the damaged aircraft - there was nothing to attach the gear door to. With most of the pod removed, about all that remained was the landing gear components. The remaining gear looked spindly and out of place surrounded by all the openness. The aircraft was flown back with the (ground) gear-lock pins safety-wired in place. It seems to me that the auxiliary power unit (a gas turbine driven generator) was located in the left main gear pod-I do not recall if any of it might still have been in place. With the gear down and locked, the C141A had to be flown at less than the "gear-down, do not exceed" airspeed. Flight planning, particularly of the fuel load, was a challenge. There was nothing close to our gear-down with part of the structure missing cruise condition in the Lockheed performance charts! The fuel load was based on a SWAG with more fuel reserve than carried on normal flights. The flight was flown with only essential crew (no space-available passengers) and fuel. The gross weight was considerably less than normal. The flight to Honolulu was flown at approximately 19-thousand feet. That allowed flying the aircraft pressurized but with a lower pressure differential than when flown at the normal thirty-something thousand foot flight levels. There had been some concern about whether the aircraft integrity would allow pressurized flight. Our leg was not the first one flown after the incident; it had already flown several similar flight profiles without problems. The legs were flown during daylight; weather was never an issue on our leg of the return flights. The climb to altitude was uneventful. We settled into the routine of our "low and slow" cruise at altitude. Navigation was easy using the good daytime Loran-C coverage in the area. Fuel used and remaining was very meticulously recorded and plotted. Our estimated fuel usage was not much off the actual usage. The route allowed several enroute alternative (island) airports should an emergency arise. We never encountered anything to make us consider changing from our flight plan. The routine included periodic position reports on HF radio. The boredom was broken by an unexpected radio call from Hickam. They said there was a USAF C-130 Rescue aircraft on the ground at Hickam, with engines running, which was requesting permission to run a practice intercept on us for a training mission. My guess is that Air Traffic Control at Honolulu had suggested us as a candidate for the intercept; I am sure that our low and slow eastbound flight stood out like a sore thumb on ATC's boards. Everyone else was high, fast, and westbound! We figured the intercept would break the normal, getting boring, routine; we accepted the Rescue "offer." Shortly we were informed the Rescue was in the air and was asking for more information from us. I pulled out the standard AF form we carried to transmit information in the event of an emergency (the only time I actually filled one out in the air). It had the standard required information: our current position, our route, estimated times to our next position and destination, number of souls on board, and fuel remaining. In the section calling for "nature of the emergency," we listed, "simulated structural damage to the left main landing gear pod." The information was forwarded by our copilot on HF radio. We were then informed of the position and time that the Rescue expected to intercept us (about two hours later). Updates were exchanged between the Rescue and MAC aircraft. When we were about 60 miles apart, the communications between us shifted to VHF or UHF radio. By ourselves in the middle of the Pacific, the chatter between crews became more informal while the updates continued. The Rescue C-130 reported us in sight and requested permission to fall into formation with us. We saw the C-130 pass under us slightly to one side. Looking for any useful information from the situation, we asked the Rescue to pull up under our left side and scan our "simulated structural damage" before falling into formation. Sensing bonus realism to their practice run, the Rescue eagerly agreed to our request. The C-130 pulled up under our left side. There were several minutes of silence as they checked out our aircraft. Then, over the radio from the Rescue aircraft came, "Gee MAC! When you guys simulate, you sure do simulate!" The second ACFT I had the honor of crew chief'ing was ACFT 7011. 7011 is now resting at North Field, in North, South Carolina. You may or may not know, we are in the process of scraping that airframe. Crews of 5 from here in Charleston have been selected to safe the aircraft for demolition. The current demolition date is 28 June 2005. I will be taking pictures of this as its happening. On a footnote, ACFT 7011 carries a very interested fact, you may or may not be able to verify this. In December 1992, following the elections which Mr. Clinton defeated the first Mr. George Bush, We went into Somalia. I was one of thirteen Air Force personnel on the ground that 9th day of December. On December 30, 1992, we were visited by Mr. George Bush, who flew in to Mogadishu Somalia on ACFT 7011. With this, ACFT 7011 was the only C-141 to ever carry the call sign "Air Force One". I have several pictures from that day that I would like to pass along. I'll be emailing you from home with scanned pictures that you may post on your site. Thank you for hosting a great web site dedicated to a great airframe! I believe the C-141 that hit the horse was Tail # 8079. This is the display aircraft at Charleston AFB (I was assigned there from 1989-2000 / Maintenance & 141 FE), for years it had a horse head painted on the front left gear pod. This aircraft was also the "personal" aircraft of Col Toolin, the LG Maintenance commander at the time. During my maintenance days, I asked some of the "old-heads" about the horse-head painting and they recalled the tale of the horse being hit at Clark in the PI. Anyhow, within the past year, 8079 has been re-painted in the original white paint scheme and someone (I'm sure leadership) decided to leave the horse-head out of the art work.